Making people laugh is nothing new to Kristin Russo. While hosting her own television show at college in Philadelphia, Kristin found that she had a gift for producing and performing comedy. She then took her antics to a live audience when she became the LaSalle University Mascot. Consider also that she played Division I Volleyball for the school, and it’s easy to see why Kristin is a woman who is capable of wearing many hats…or costumes. Since graduating from college, she has appeared in national ads for Diet Coke, was chosen as a finalist for MTV’s “The Real World: Las Vegas”, and was picked to be a character in an online video game. Kristin has also been selected for several roles in various independent films, including “Fuel” and “Living in Technicolor”. After taking a class at The Funny Bone in Cincinnati, Kristin found a new passion: stand-up comedy, and it’s no surprise she has developed a knack for it as well. 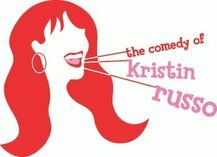 Mascot, TV host, commercial and indie film diva, video game character, and now comedienne, Kristin Russo is an easy choice for a dependable performer who knows how to bring the funny.